Introduction to Geography, a free online textbook. When you look at a mountain, hill, or valley, you probably judge it with some aesthetic sense, an appreciation for its form. Geographers look at the physical landscape with a similar appreciation, asking the questions, "how did this landscape form?" and, "how is it changing?". Geographers may be interested in only the physical system of landforms, but they become especially interested when some of these systems represent a hazard to human populations living near certain landforms. Forces from inside Earth create major features like volcanoes and mountain ranges. These forces are called endogenous (from within) forces. Gravity, water, ice, and wind reshape Earth's surface from the outside. These forces are called exogenous forces. We focus here on the most elemental of these forces, weathering. A fundamental characteristic of many landforms is a slope. Slopes are in dynamic equilibrium, that is, forces are balanced to move them downhill at a certain rate. This downslope movement of material is called mass movement. Occasionally those forces change and slopes move much more rapidly. Two particularly dangerous forms of rapid mass movement are landslides and lahars. People may be exposed to these dangers, called environmental hazards. As the plates float, they move together and apart. Plates move together at convergent boundaries and divergent boundaries where they move apart. Transform boundaries occur where plates move sideways relative to one another. 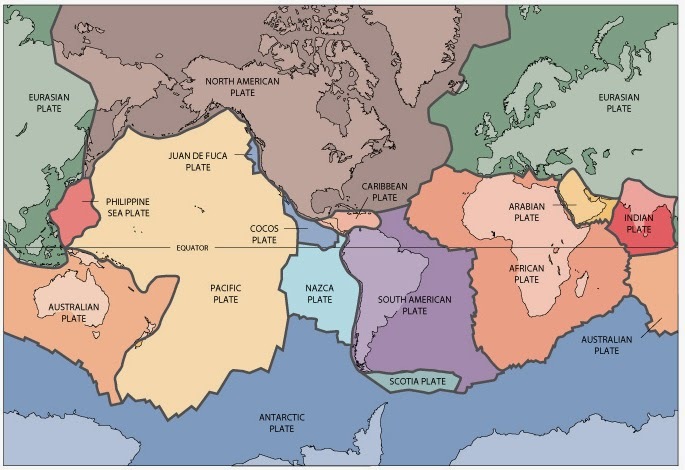 Source: USGS, Diagram by José F. Vigil from "This Dynamic Planet" map produced jointly by the USGS, the Smithsonian Institution, and the U.S. Naval Research Laboratory. Accessed from http://pubs.usgs.gov/gip/dynamic/Vigil.html. Click for larger view. Black circles and dots represent earthquakes. Red triangles represent volcanic eruptions. Source: Detail of 2006 map "Geologic Investigations Map I-2800: This Dynamic Planet" by Simkin, Tilling, Vogt, Kirby, Kimberly, &Stewart, cartography by Stettner, Villasenor & Schindler. USGS, Smithsonian, and US Naval Research Laboratory. This chapter will not go into the details of plate tectonics, earthquakes, or volcanoes--there is enough information on those topics to fill several chapters! This section simply introduces these endogenous forces so you can understand that forces within Earth create mountain ranges, volcanoes, and some other major landforms. These landforms are then worn down by exogenous forces. As soon as endogenous forces start to create landforms, they are worn down by forces of gravity and the atmosphere. These forces can be dominated by one process or the other, or they can be in balance. Consider the highest peak on Earth, Mount Everest. On Mount Everest these forces are roughly in balance with endogenous forces slightly greaters. Some landforms on Earth have a greater dominance of endogenous forces, like rapidly developing volcanoes, while others experience predominantly exogenous forces, like the Appalachian mountains of the Eastern United States. The breakdown of rocks into smaller and smaller particles is called weathering. Weathering takes place near the land-atmosphere interface when rocks react with, and are acted upon, by air and water. Physical weathering is the fragmentation of rocks into smaller pieces through fracturing or abrasion. The rock is not changed except for in size. For this reason, physical weathering is also known as mechanical weathering, in contrast to chemical weathering, where a chemical change in the rock takes place. Water plays an important role in many physical weathering processes. One of the most common and perhaps the most spectacular forms of weathering is frost weathering, also known as frost wedging or frost shattering. In this process water seeps into pores if the rock is permeable. Even in impermeable rock, water can seep between cracks or joints in the rock. When temperatures dip below 0° Celsius (32° Fahrenheit), ice can form, expanding in the space. Over time, with repeated freeze-thaw cycles, a buildup of ice in the rock breaks the rock apart. This phenomenon is responsible for the breaking of rocks from high mountain faces as well as the disintegration of rocks into smaller pieces on relatively flat ground. Needle ice, a peculiar form of frost formation. Author's fingers included in image for scale. Needle ice forms vertical columns, or needles, perpendicular to wet ground when the air temperature drops below freezing. Needle ice displaces ground, including sizeable pebbles, and where it occurs it is partly responsible for soil creep, a slow form of mass wasting. Another form of physical weathering is salt crystal shattering, where water evaporating from near the surface of a rock leaves behind crystals of salt. As the crystals grow, they can break apart the rock mechanically. This process is more common in areas with warm weather and occasional rain. A third form of physical weathering is thermal weathering, where rock surfaces exposed to hot and cold expand and contract more than the interior of the rock. The resultant stress can break the rock surface. Finally, the release of pressure as a rock that was formed deep underground is exposed can result in pressure release, where the rock shatters into large sheets. Chemical weathering involves the breakdown of rock into smaller pieces through a chemical change in the rock. Water plays a key role in most chemical weathering processes. The susceptibility of a rock to specific chemical weathering processes depends on the composition of the rock. Particularly important in areas with abundant water supply, warm temperatures, and carbonate rocks (like limestone) is the process of carbonic acid solution, also known simply as carbonation. In this process carbon dioxide from the atmosphere dissolves into rain, forming very slightly acidic rainwater. This rainwater is acidic enough to dissolve certain rocks, and as it trickles and flows through cracks in the rocks, extensive cavern systems can develop. Eventually these caverns can collapse, creating sinkholes. When many sinkholes join together, "tower karst" can form with tall pillars of rock. Hydrolysis and hydration occur when minerals in rocks react or combine with water, weakening the rock and making it easier to break. Finally, rocks near the surface can react with oxygen in a process called oxidation. We know oxidation best as rusting, when oxygen reacts with iron in the presence of water. Physical and chemical weathering may work in combination, or one process may dominate. Some weathering processes create unique landforms. A common characteristic of many landforms is the slope, where topography changes from high to low. Not every slope has each of these features but it's useful to consider the role of each. The upper convex section marks the beginning of the slope. The cliff face, if present, is often made up of more resistant material, like bedrock. As that material weathers, it falls and piles up in the straight section. Moving water may transport some of that weathered material further away from the cliff face, leading to a gradual lower concave section. Here is a slope in Capitol Reef National Monument, Utah, which matches the features shown in the diagram fairly well. The lower portion of the slope in the photo is not as ideal as that shown in the diagram. Slope in Capitol Reef National Park, Utah. 2014 photo by author. Any time weathered material moves downhill with gravity as the primary force, it is called mass wasting, also known as mass movement. Mass wasting is differentiated from transport of weathered material because in mass wasting the primary mover is the material under the force of gravity. When weathered material is transported, in contrast, wind, ice, and water are responsible for moving the weathered material. Mass wasting can take place extremely slowly or extremely quickly. The slowest example of mass wasting is soil creep, where the surface of a slope very gradually shifts downhill. You may have observed evidence of soil creep if you've seen a fence line tipping downhill in a field, or a poorly constructed retaining wall collapsing. The fastest mass wasting event is rockfall, where a rock falls freely down a vertical cliff face. We'll take a moment to define each of these mass movements and discuss important distinctions between them. Rock falls have already been discussed and are easily understood. Debris avalanches are fast-moving, wet avalanches of rock, soil, and whatever else gets caught up in them moving down steep slopes. Because they are wet, they tend to travel a long ways even when the slope lessens. If confined to a channel the term debris flow is used instead. A special type of debris avalanche or flow originating from volcanoes, called a lahar, is known for having the potential to be extremely large and travel quite far, quite rapidly, especially if melting snow and glacier ice adds to the water content of the flow. Landslides and earth flows (also knowns as mud flows) do not move as rapidly but still fast enough to present a serious danger to someone in their path. The difference between these mass wasting events is the amount of water present, and therefore the way they move. Landslides represent movements of large masses without a lot of churning or turning. The "slide" in the name indicates that landslides mostly move along a surface. On the other hand, flows churn and flow downhill, not sliding. The slowest movements are soil creep, when the ground is not saturated with water, and gelifluction, the slow flow of saturated soils. Gelifluction is especially common in very cold climates where permafrost is common. All of these mass movements can affect people. 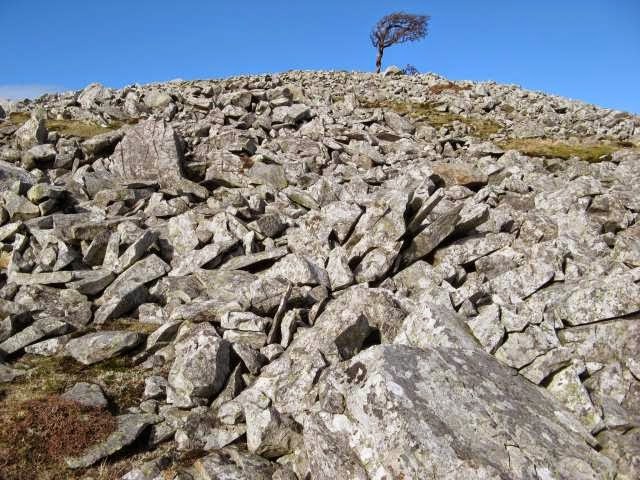 Rock climbers must be careful to avoid rockfall, and contractors building a house or road must consider the potential for soil creep to affect the stability of their constructions on slopes. But the large, faster-moving mass wasting events are particularly hazardous to people and cultural landscapes. Travelers watch and wait as an excavator clears a partially destroyed road in Himachal Pradesh, northern India. Heavy rains created very saturated conditions, weakening the slope above. The torrent of water, rock, and plants covering and crossing the road destroyed much of the road and buried the rest. A remnant of hand-built retaining wall against the extremely steep slope is visible at lower right. 2007 photo courtesy of the author. These hazards exist not only because large mass wasting events occur at relatively high speeds, but because people often live in river valleys where they are particularly exposed to the hazard. River valleys can constrain the material in a mass movement, making it deeper; water present in the valley bottom can also serve to lubricate the mass movement, increasing the distance it travels. Landslides typically slide along a bed surface taking several forms, such as rotational slides or translational slides, depending on the composition of the sliding material. Many landforms northwestern Washington state are prone to landslides. In particular, massive deposits from the continental glacier that once covered the Pacific Northwest are cohesive enough and recent enough to form steep slopes where eroded by rivers and ocean waves, yet not nearly as cohesive as bedrock, allowing deep failure of slopes and resultant landslides. 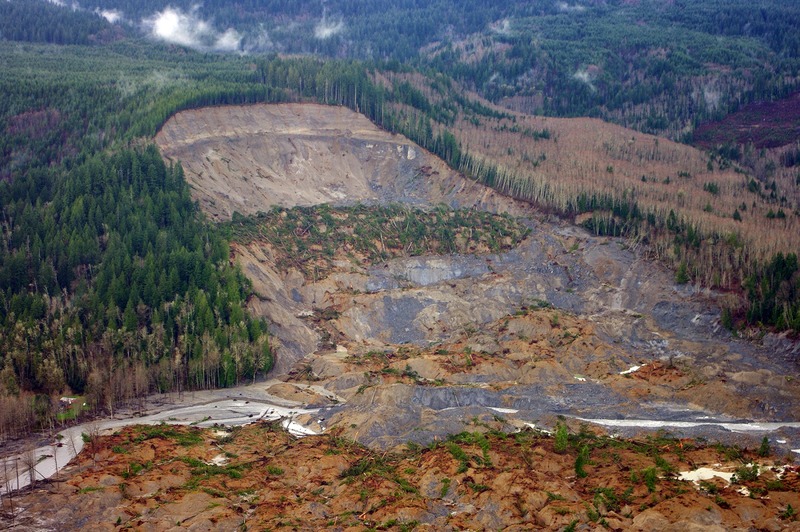 Two recent, large landslide events in northwest Washington have attracted national media attention. March 27, 2013 Ledgewood (Whidbey Island, WA) landslide: Near the town of Coupeville on Whidbey Island, a large landslide occurred early in the morning, destroying one house and leaving several others condemned in the Ledgewood neighborhood of Whidbey Island. Fortunately no one was injured in the slide but questions remain about access to the houses further down the beach as the landslide destroyed the county road. The Ledgewood landslide was massive. Geologists for the Washington State Department of Natural resources estimate enough material to fill 40,000 dump trucks moved in the slide. The images show how this rotational slide slid on a curved bed, with a steep upper wall but the material on top of the slope (trees and the single white house) mostly remaining on the surface. The beach gained approximately 30 feet elevation as it was thrust up by the rotation of the slide mass. 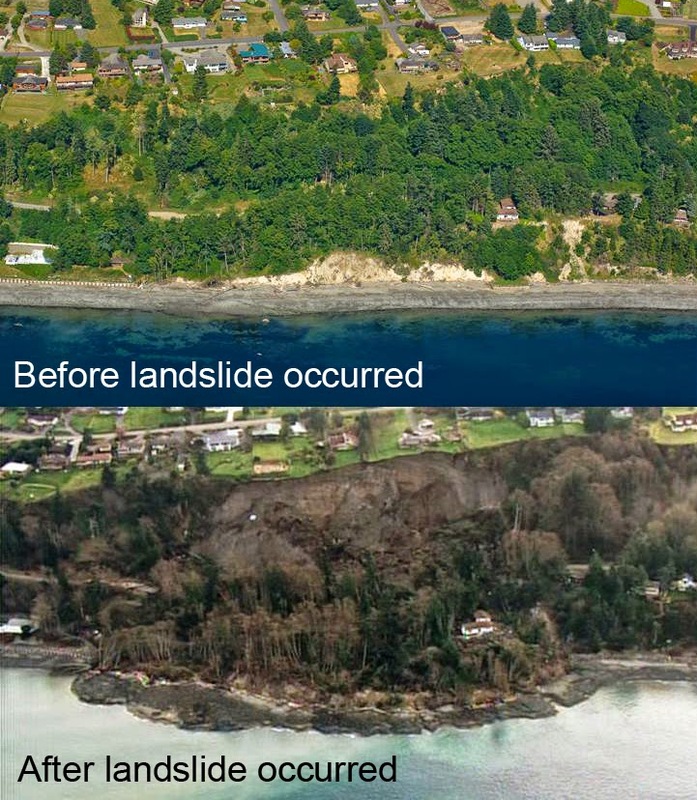 Locations like Whidbey island, where people choose to build houses at the top of and underneath steep bluffs of potentially unstable material, are home to frequent landslides. 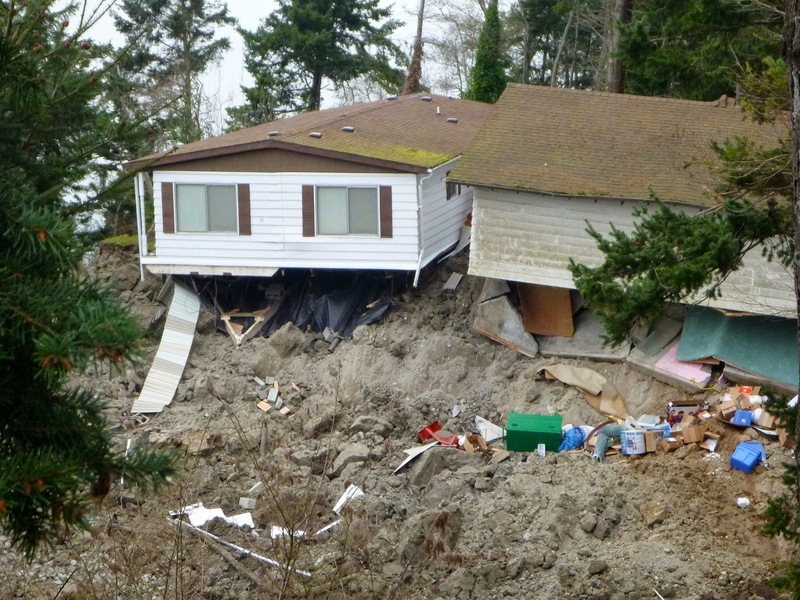 March 22, 2014 Oso, Washington landslide (also known as the "Oso mudslide"). On Saturday morning, March 22, 2014, a large landslide occurred on the valley wall of the Stillaguamish River valley. The upper portion of the slide appeared typical of a slump-rotational slide, similar to the Ledgewood slide just reviewed. However, the slide did not behave typically, moving much faster, further, and chaotically across the valley floor. So much debris moved so fast that 43 people living across the river from the slide were buried and died. It's easy to second-guess decisions once we have the benefit of hindsight, and we may never know how much information people had before the slide. But clearly the people who perished in this massive slide were living at high risk under a hazardous slope. Their lives may not have been lost at such great cost, though, if we can draw lessons from their tragedy to save the lives of others. Geologists are already working to learn more about the causes of the landslide, including the relative role of rainfall and deforestation. The area immediately above the slide, where water enters the ground and percolates downwards through the slope, was marked as a "no-logging zone" by the Washington State Department of Natural Resources. Yet a 2004 clear cut extended into the no-logging zone, and much of the area remaining at the top of the new landslide was clear-cut earlier. A known, but quiet risk: About 80 miles to the south, a larger town lies at risk from a major mass wasting event. This is Orting, a town about 25 miles away from Mount Rainier, a towering volcano, Washington state's highest peak at 14,409 feet above sea level. Here we see alternating, poorly bonded layers of volcanic rock. Volcanic rock is easily weathered and in locations where glaciers form (cool average annual temperatures and adequate precipitation), glaciers easily cut through these layers. As the glacier cuts down through the rock, and especially as it recedes with warming climates, it exposes an oversteepened slope. This slope represents a landslide hazard. Massive collapses of the steep slope may be triggered by small earthquakes or minor (non-eruptive) activity inside the volcano. When a large landslide slides onto large quantities of snow or ice, the ice melts and a lahar is formed. Lahars are rapidly moving mixtures of volcanic material and water that obliterate everything in their path. 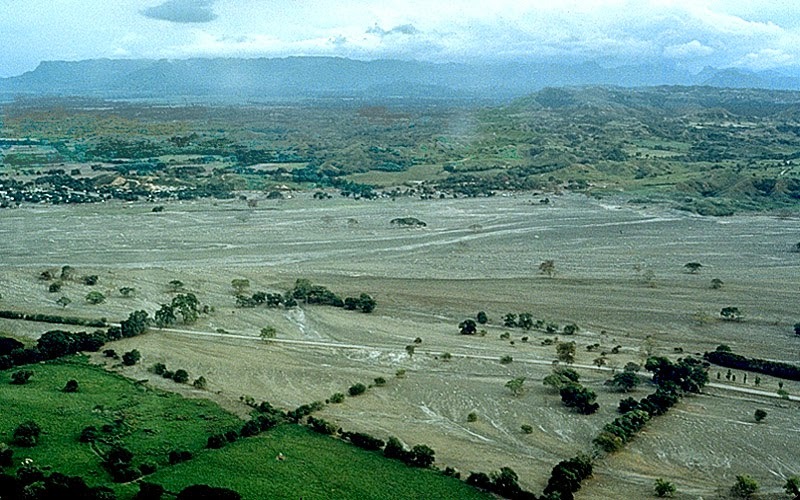 Here is an image from Armero, Colombia, a town of about 28,700 where 3/4 of the population died in 1985 when a lahar triggered by a small eruption buried nearly the entire town. The few remaining buildings in town are visible at the far side of the valley, which is filled with lahar debris. Armero is 100 kilometers downstream from Nevado del Ruiz, the volcano from which the lahar originated. The picturesque scene below is of the Puyallup River valley near Orting, Washington, with the northwest side of Mount Rainier in the distance. Lahars from Mount Rainier have traveled here before. In fact, the town of Orting is built on many feet of mud left behind by previous lahars and Mount Rainier's oversteepened upper slopes are clearly visible. 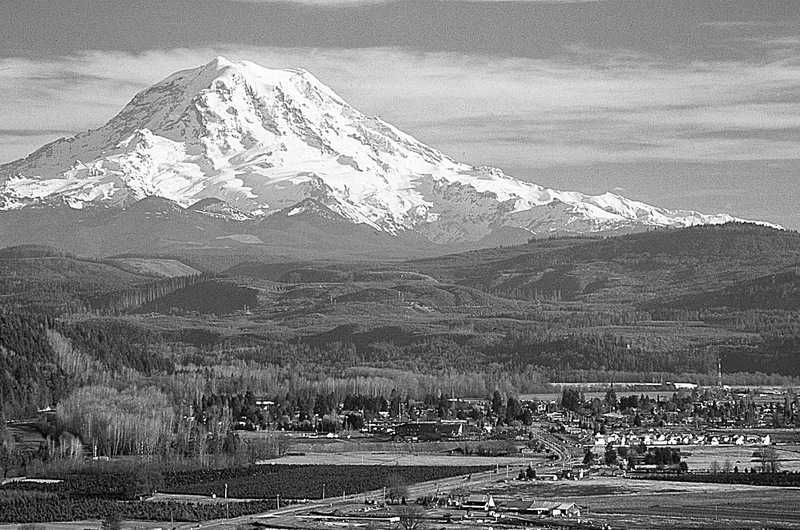 People have known about the risk of lahars from Mount Rainier for many years, but the town of Orting continues to grow. There is a warning system in place that may give people about 40 minutes warning to evacuate to higher ground, which is more warning than would be possible for any resident of the Stillaguamish River valley below a major slide. But even if you were able to escape with your life, is it responsible to allow people to invest in property in such a hazard zone? It may seem like an open question, but so far, even with the lessons from Oso, the planners and politicians responsible for allowing continued development in Orting continue to say "yes." Free use for education. Text and photos copyright 2013 Tim Scharks unless otherwise indicated. Powered by Blogger.